Cleaning might not be your favorite holiday activity, but it’s essential. Whether you’re hosting friends or your in-laws, it’s important that your home sparkles and looks its best. You never know who else might be coming down the chimney to take a peek. So make a list and check it twice, muster all of your holiday cheer and green clean away! Focus on the Entryway – If you want to make a good first impression, you need to start with the entryway. It’s the first part of the house (besides the outside) that your guests will see. Tidy it up by removing unnecessary excess items, add a coat rack, or clean out the hall closet so guests can hang their coats there. Add a small table or chair near the door where hostess gifts can be left. Wipe down the door, shake out the doormat, and vacuum up dust and dirt collected on the floor and furniture legs. A good cleaning mixture for doors and baseboards is a cup of white vinegar and a few drops of your favorite essential oil. Scrub The Loo – Everybody is going to need to use the restroom, especially after drinking down those holiday cocktails. So make sure it looks spick and span. Use a microfiber cloth to scrub down the counters and mirrors. Clean out the toilets, sinks, and shower/baths, too! Don’t forget to mop the floors and make them sparkle. Use Fresh Aromas – When the guests arrive, you want your house to not only look fresh but also smell fresh. 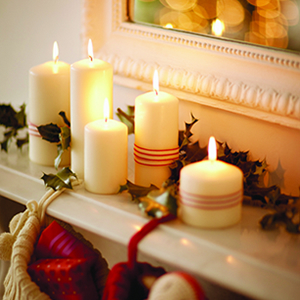 Our sense of smell is powerful and it can put us in the holiday spirit if it’s done right. Fill a spray bottle with herbs such as lavender and chamomile to freshen your house. You can also grind the herbs up with baking soda in a food processor and sprinkle them on the rugs and carpets to remove odor there too. Organize the Kitchen – Start by cleaning the stovetops and ovens. Food is important and so are the places where it is cooked. You can use baking soda and water to rub off the gunk. Then organize the rest of the kitchen. Put away countertop items that won’t be used for the night. Polish any serving dishes and utensils with a solution of vinegar and salt, and clean out your fridge! You need to save room for all of the leftover stuffing, turkey, and mashed potatoes! Freshen the Guestroom – You can’t keep all of the bedroom doors locked in your house. If you’ve invited guests to stay the night, then their rooms need to be livable. Fluff up their pillows, wash the sheets, detox the air with a nice houseplant. Whatever you need to do to make the room feel homey and safe, do it. Use natural laundry soaps and mild, scent free detergents to make sure the sheets and towels stay safe. There’s nothing worse than feeling uncomfortable where you’re staying. Clear the Windows – Peering out the window to see who’s arriving is always exciting but not if you can’t see out them. Mix some vinegar and water in a spray bottle and wipe down the windows with a reusable microfiber cloth to keep them looking clear and streak-free. Your microfiber cloth will come in handy this cleaning season. If you don’t have one yet, we can help you with that! Check out our website to find our latest products http://uswiping.com/ or give us a call at (314) 421-3311 if you have any questions! We want to help you make the best cleaning decisions! Get a Sparkly Home With a Surprising Tool – Vinegar! We live in a world full of harsh, toxic cleaners. The house can smell like chemicals for days, and you’re pretty sure those ingredients aren’t safe for your kids, your pets, or yourself. We can only last so long in a poisonous cloud of cleaner before we find ourselves running for the hills in search for a better solution, and now that solution is here! For about $3 a gallon, vinegar can free you from chemical-based cleaners and still give you the sparkly clean home you love. Help the environment, your home, and your family with these vinegar cleaning tips! 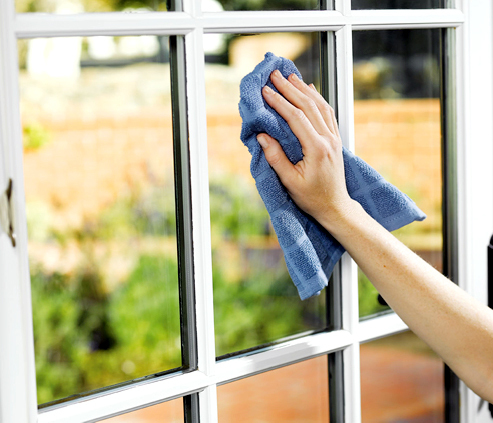 Dirt and streaks don’t stand a chance when you wash your windows with vinegar! Make a solution from one part water and one part vinegar. Add a few drops of dish soap, and you’re done! Spray the solution on the window and wipe off with a clean cloth. If any pesky streaks do remain, banish them for good by rubbing over them with newspaper. Keep harmful chemicals away from your food by cleaning the inside of your fridge with apple cider vinegar. Removing the food and wiping down your fridge with equal parts water and apple cider vinegar once a month will not only keep things sparkly, but will also keep any questionable smells at bay! No matter what you’re cleaning with, mopping wood floors is tricky. Many cleaners leave a nasty residue and others will kill the wood. With vinegar, cleaning wood floors is easy and you won’t need to worry about hurting your home! Mix ½ cup of white vinegar with a gallon of warm water for the perfect wood floor cleaner and mop away! For a deeper clean, use the same ratios and scrub the floors by hand to get rid of any chemical residue that may be sticking and attracting dirt. You don’t have to stop at your home surfaces when it comes to cleaning with vinegar! It’s also great for cleaning off the dirt and waxy buildup on your fresh produce. Add a tablespoon of apple cider vinegar to every 4 cups of water and soak the produce for a few minutes before gentry scrubbing, rising, drying, and enjoying! While it’s better than a chemical scent, vinegar still isn’t most people’s favorite aroma. To give your vinegar a nice smell, fill a large jar with lemon or orange peels and cover with vinegar. After two weeks, strain out the peels and enjoy your new citrusy vinegar! The smell may not go away completely, but you can rest easy knowing that the smell is perfectly safe. Your health and your home are sure to thank you for switching to a green cleaning alternative! For any other cleaning needs, equip yourself with the best tools from US Wiping Company. Visit us any time at www.uswiping.com or call 1-800-279-2051.